In addition to providing Prohibition-weary legislators with a partial escape from the 18th’s increasingly unpopular reign, Henderson’s rhetorical success also sprang from a number of his personal attributes. He was an adept scientific showman, he enjoyed the limelight, he knew how to pitch arguments effectively to a nonscientific audience, and, perhaps most important of all, he liked a good fight. 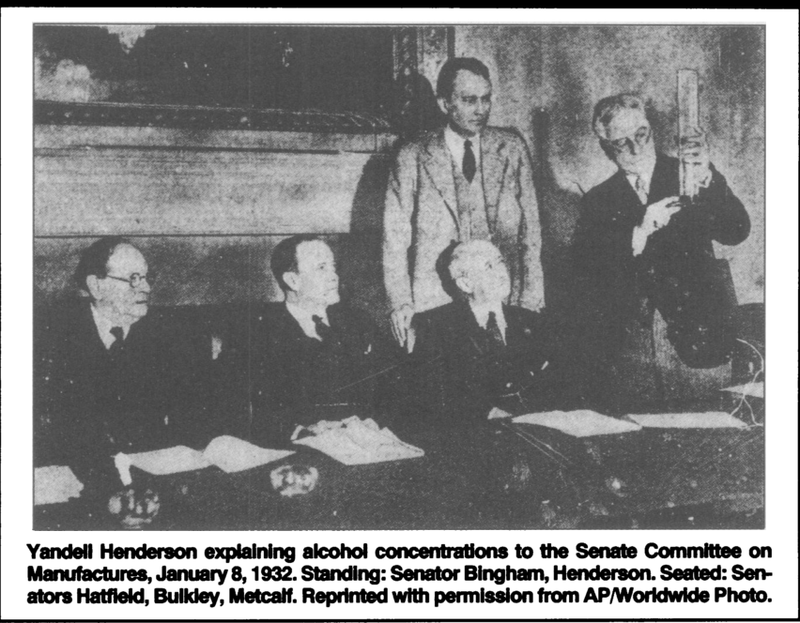 Henderson’s Laboratory of Applied Physiology at Yale would become — less than a decade after Repeal and under his successor as the lab’s director, Howard W. Haggard – the home of both the Yale Center of Alcohol Studies and the Quarterly Journal of Studies on Alcohol, two key institutions in the rise of a post-Repeal mainstream alcohol science establishment in the U.S. Pauly’s account of how expediency drove Congress’s favorable embrace of Henderson’s pronouncements also represents a dramatic case study in self-serving selectiveness and baldly dubious scientific assertions stemming from the interface between science and policy. In what follows, I’ve added merely a footnote to Pauly’s paper, offering further evidence of Henderson’s gladiatorial contrarian inclinations with respect to hot political issues. In the U.S. in the pre-World War I period, the anti-beer layer of temperance movement rhetoric was fueled a growing wave of anti-German sentiment. Many of the nation’s major brewers had German company names and German-American chief executives. World War I began in Europe in July 1914. Thereafter, a series of aggressive events – including attacks on U.S. merchant ships by German submarines, the sinking of the Lusitania, and, finally, British intelligence’s interception of the Zimmerman Telegram – led the U.S. to declare war on April 6, 1917. 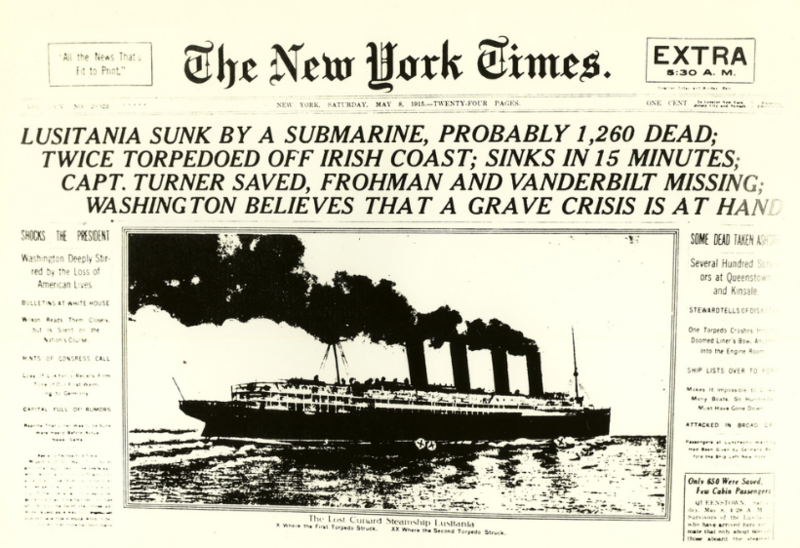 Domestic debate over U.S. entry into the war ramped up in the aftermath of the Lusitania’s sinking, on May 7, 1915, with that tragedy’s loss of 128 American lives. Henderson, the remarkably adept scientific spokesman for low alcohol content beer, entered the war-or-no-war conversation in this charged post-Lusitania atmosphere. 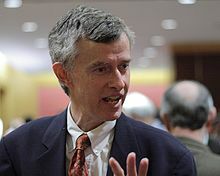 He published two controversial letters in The New York Times expressing a pro-German stance and opposing U.S. entry into the war. One aspect of his initial letter particularly prompted a string of passionate responses in the Times and other newspapers. Yandell Henderson was born in Louisville, Kentucky in April, 1873. He received his Ph.D.at Yale in 1898. He then traveled to the University of Marburg, studying under Albrecht Kossel, who was later awarded a Nobel Prize in physiology and medicine “for his work on the biochemistry of proteins, especially nucleoproteins.” Henderson also worked with Karl Voit in Munich, “whose main interests were nutrition and metabolism, especially in regard to proteins.” He returned to Yale in 1900. This post-doctoral experience in Germany doubtless laid the foundation for Henderson’s subsequent pro-German sentiments. The Times published Henderson’s first letter on May 21, 1915, only a fortnight after the Lusitania disaster. 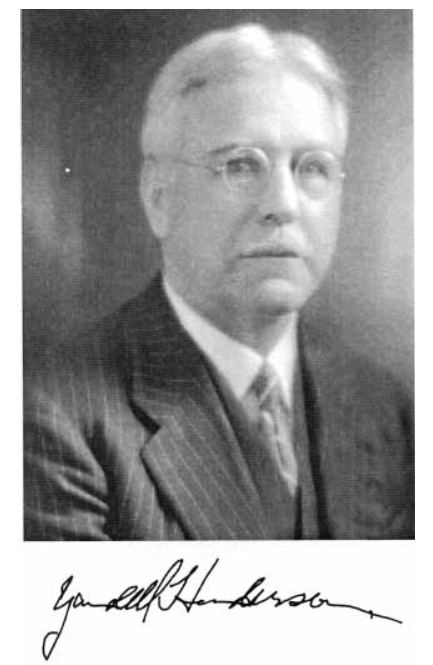 Therein, Henderson argued vigorously against the rising tide of anti-German sentiment and the nation’s seeming drift toward war with Germany. He took a neutralist or fair-play-for-Germany attitude. Among other points, he cautioned that Germany’s case for the war had not been “fairly put” before the American public, whereas England’s case had been offered “with consummate skill.” He reminded readers that the Lusitania was not an American but a British ship. Although Henderson conceded that the ship’s sinking was “horrible,” he also argued that its loss probably saved many more lives than were lost. “The ammunition which the Lusitania carried,” he wrote, “would have slaughtered thousands.” He continued: “Have not those who may be made widows and orphans in Germany a right to expect of their Government that, in any possible way, it will prevent that ammunition from reaching their enemies.” He noted that U.S. interests in the war were “a trifle” in comparison with England’s and Germany’s. Toward the end of his letter, Henderson commented on Germany’s alleged wartime misconduct. 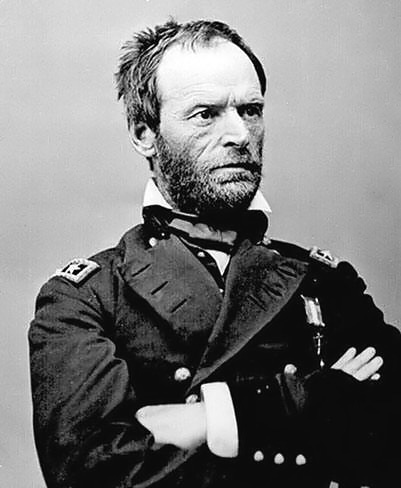 “As for atrocities,” he wrote, “Belgium, Serbia, East Prussia, and Poland have probably been no more thoroughly desolated than Georgia after Sherman’s march to the sea.” This remark, especially, sparked controversy. Henderson replied in early June (NYT, 6/3/1915). He objected to the characterizations of “people celebrated for their kindliness and sense of duty” as “’Huns,’ ‘barbarians,’ & c. because outrages have been committed by some of their soldiers in hostile countries.” He recoiled at calls for his dismissal from Yale, which had been suggested in a couple eastern newspapers, citing the American value on free speech. “I have been made to feel,” wrote Henderson, “how exceeding uncomfortable, if not dangerous, it may be for an American to exercise the right of free speech.” In reference to his Sherman parallel, Henderson shifted ground. He recalled his boyhood in a border state – “half the men whom I knew and admired, as only a boy can,” he wrote, “had worn the blue and half the gray.” He wrote of accounts he heard of “marauding stragglers of whom there were many from both sides in the areas over which the armies fought.” Their acts, Henderson suggested, “were remarkably like some of those attributed to Germans by Belgians and to Russians by Germans.” War bred excesses no matter whom the combatants, Henderson argued. He closed his letter by leveling a charge against Trevelyan’s British homeland. After the Russo-Turkish War (1877-1878), Henderson asserted, Britain’s role in furthering the Treaty of Berlin restored a large fraction of the war-liberated Balkan peoples once again “to the tender mercies of the Turks.” The atrocities they subsequently suffered, Henderson continued, generated the Balkan hostilities from which the larger war ultimately developed. Henderson’s suggestion that Trevelyan’s Britain bore responsibility for the war’s origins perhaps highlighted his no-holds-barred approach to disputation. The Times editorial board once again lodged a comment (NYT, “Topics of the Times,” 6/4/1915) on Henderson’s new letter, responding to his comments on free speech. The Times suggested that anyone offering unpopular opinions should be prepared to see free speech exercised in the responses of others, who are “…equally privileged to say what they please about his statements and about him for making them.” “If they can prove him inaccurate,” the editorial comment continued, “they will certainly do so, and any ideas they may have in regard to a man whose inaccuracy is of his sort they are also sure to express with such vivacity as in their opinion the circumstances demand or justify.” The same day’s edition of the Times published a letter by George Haven Putnam, of the Putnam publishing family, who had experienced the Civil War both as a combatant and prisoner of war. Putnam objected to Henderson’s failure to distinguish between the unfortunate chaos of war, on the one hand, and, on the other, the deliberate actions of military commanders. Starvation, of course, was no hardship for mere American women, children, and graybeards, even though they were descendants of men who at Eutaw and the Cowpens, at King’s Mountain and Yorktown, had done their best to win American independence. If they had been Belgians, now–well, there wouldn’t have been even the difference of the two letters betwixt Sherman and German. Perhaps Henderson found some solace in gaining an ally, albeit one with a different rhetorical goal. Three more letters followed, but I’ll stop here. Henderson’s Lusitania letters further vouchsafe Phil Pauly’s picture of a man who loved a good fight. As with alcohol, Henderson was no specialist in Civil War military history, a topic far afield of his discipline and training. He doubtless suspected that his letters would become a lightning rod for spirited responses. Yet, Henderson showed no inclination to back down when his controversial parallel between German atrocities and Sherman’s march was vigorously challenged. Yandell Henderson’s combative disposition with respect to anti-German sentiment in the U.S. after the Lusitania’s sinking in 1915 renders his unlikely, yet crucial, role in the nation’s awkward re-legalization of 3.2% beer in April, 1933 just a little less remarkable, I think. Don’t you?